Clear color. Aromas and flavors of browned banana bread crusts, walnuts, green coconut shell, and glycerin with a glycerous, vibrant, dry-yet-fruity light-to-medium body and a peppery, charming, medium-length finish conveying notes of banana muffin, lemon zest compound butter, sea salt, and cracked peppercorns finish. A fruity white rum that delivers intense banana flavors. Bottom Line: A fruity white rum that delivers intense banana flavors. 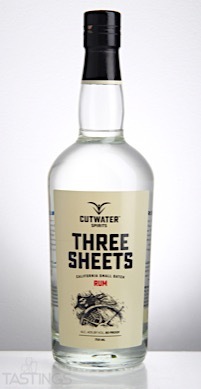 Three Sheets Rum rating was calculated by tastings.com to be 88 points out of 100 on 3/20/2017. Please note that MSRP may have changed since the date of our review.